In a woman’s repertoire was the ability to remake dresses from one fashion to another, or to update a look with new trims and decoration. In particular with children’s clothing, it was important to make them last as long as possible because children grow! 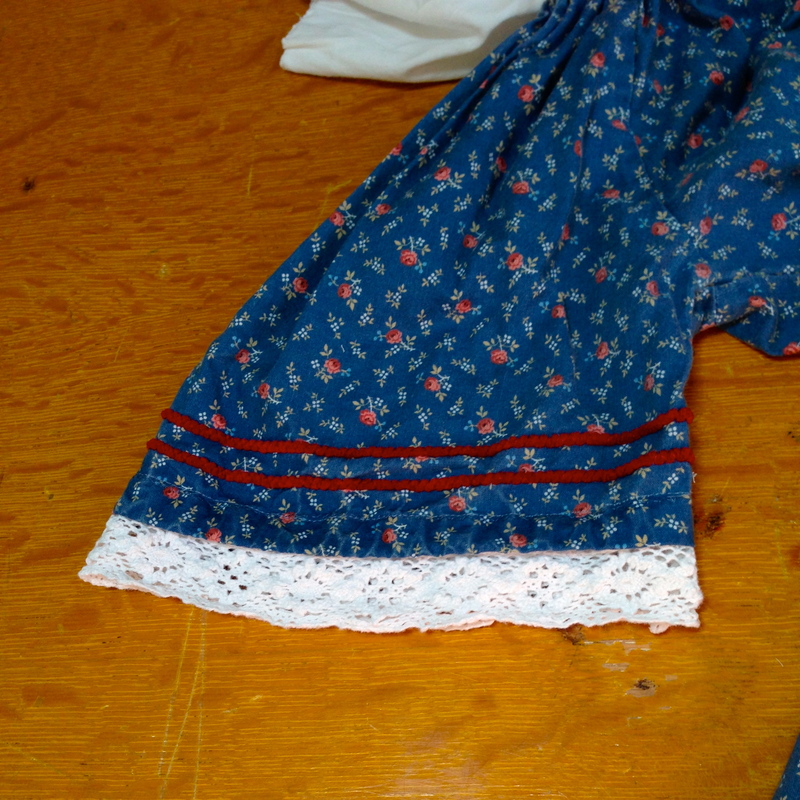 If you ever read Laura Ingalls Wilder, she refers to Ma “turning” hers and Mary’s dresses. This involved removing the skirt from the bodice and turning it so that the hem became the waistline. This would hide worn hems and keep the skirt looking fresh. Children’s clothing was also often made with growth tucks and extra wide seams so the clothing could be let out as the child grew in height and size. 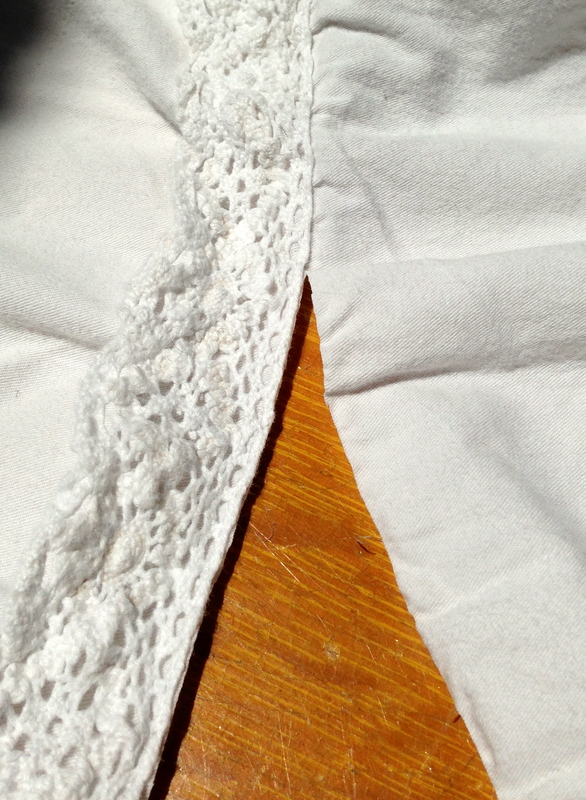 When tucks were removed, a pair of faded lines would show and the part of the fabric that was inside the tuck would be a bit darker than the part exposed to washing and sunlight. To help disguise this, trim was frequently sewn over those lines. 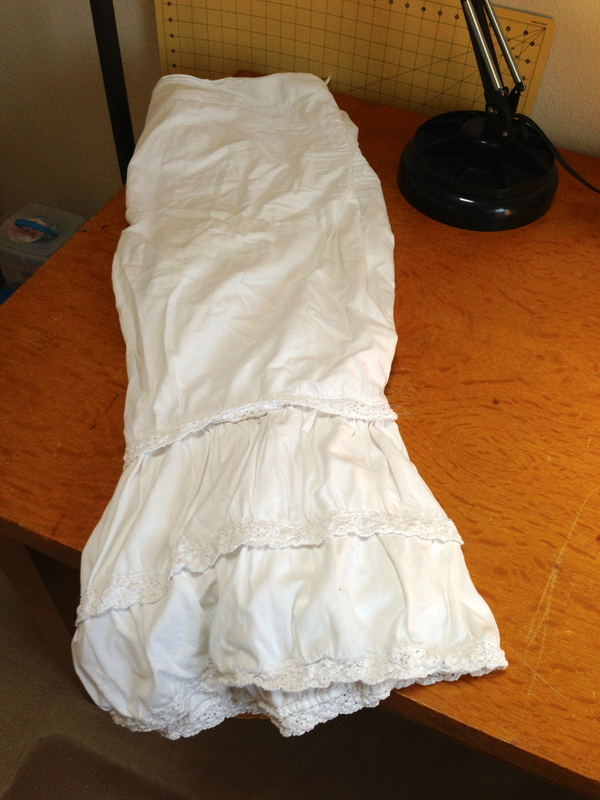 Today I want to show you one method to making your child’s reenactment dress last a little longer. I bought this dress when my daughter was 4 1/2. She has worn it through two full seasons and I expect she will wear it through the current season. When I first bought the dress I took up 4″ in growth tucks, they have all been let out but the dress is still a bit short. Because it fits her nicely through the body, I wanted to add length. Since this is all about reusing and recycling, I started with a pair of drawers I had that developed a tear that could not be repaired. The drawers have nice lace and are gently ruffled. I cut off the lower portion of each leg and threw away the rest. Next, I decided to use two of the three bands of lace to extend the length of the dress. I carefully cut close to the edge of the lace. Once I cut away the lower portion, I cut open one seam. Because the drawers were made with a serger, to eliminate bulk, I cut away the entire seam, and I was left with one long piece. The hem of the dress is 78″ and each individual section of the lace was 50″. 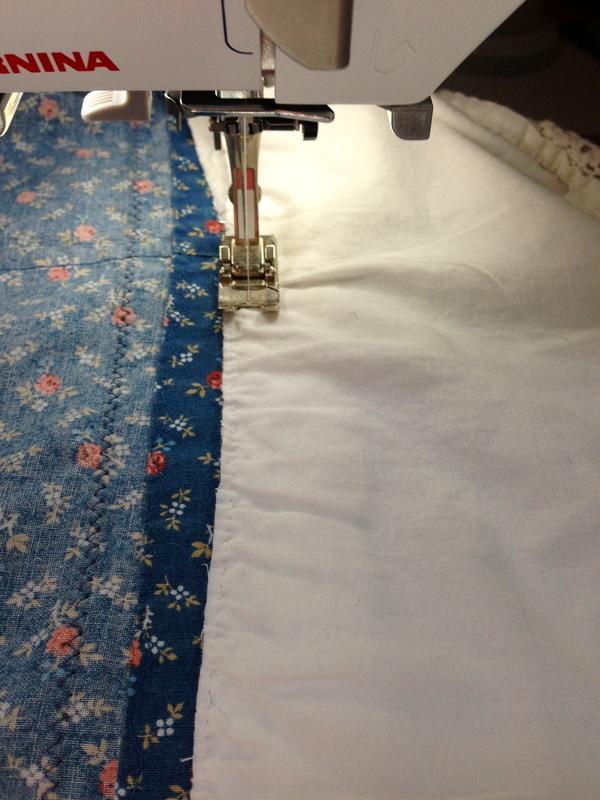 So, I next sewed the two sections together, making one 100″ long piece. I determined I would sew just next to the edge of the lace and placed it on the inside of the hem. 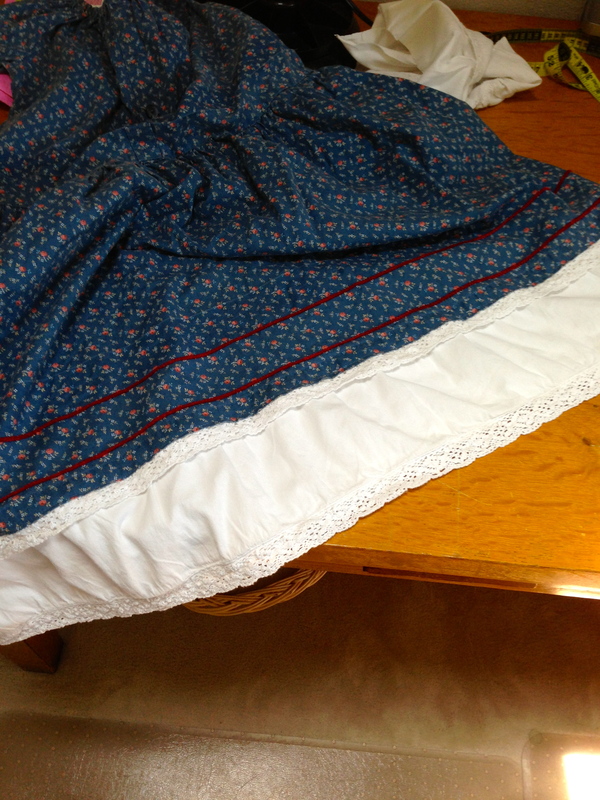 I made sure that the edges met at the end, stitched them together, then finished sewing the lace onto the skirt. Because my daughter is tall, I am quite used to adding length to her dresses and pants. If you aren’t, be sure to carefully measure the exact length of the skirt hem, then measure again. Cut your lace with enough to make a 1/4″ seam, then stitch it right sides together. Finally, sew it to the skirt. A tip for measuring the exact length you need is to pin the lace into place and baste it, then cut the length. You would have to remove the basting and I would never take this extra step. It depends on your comfort level and sewing experience. Now, a friend mentioned to me that if I added a bit of lace to the sleeves it would look more like I intended to have that white ruffle all along, so I used the third piece of lace from the drawers to do just that. I cut away every bit of fabric and seams possible while still retaining about 1/2″ of fabric above the upper edge of the lace. I did this because the sleeve is an elastic gathered sleeve. (Yes they had elastic, yes they used it.) I couldn’t stitch right on the edge of the sleeve because of the casing, hence the extra 1/2″. I removed the elastic from its casing, then pressed the sleeve nice and flat. Next, I attached the lace to the inside of the sleeve. Finally, I added the elastic back into the casing. Because our dress has a belt it will hide the faded lines from the bodice tuck I let out. This much extra length should get my daughter through at least this year, maybe even one more…fingers crossed! This entry was posted in Pictures, Projects and tagged child reenactors, children during the Civil War, children's clothing in the 19th century, children's dresses, Civil War reenacting, reenacting, sewing. Bookmark the permalink.